one another, they will not find a perfect rest. We can plan many things, carefully drawing designs, listing steps, following through with what inspires or seems important in order to move us in a direction we want to go. Sometimes, however, a great wave rises up in our world, and we are caught in a current of events that sweeps away all, or nearly all. You have little choice but to let go into the current. During this time, it’s all you can do to focus on the necessities at hand, swimming along in the current stroke by stroke, aiming toward home. Though we may have experienced an undertow earlier, or previously been nearly carried away by a powerful wave, it doesn’t make it easier when the tsunami rolls in and we’re caught in its path. Making it through to the other side is more than a struggle, it’s a miracle of perseverance. In Yehuda Amichai’s poem, “The Amen Stone,” Amichai describes a destroyed Jewish graveyard, and the painstaking effort of a man whose yearning for wholeness has made it his work to restore a fragmented and broken past. Though the tsunami of events that destroyed the graveyard happened ages ago, the effects of the fragmentation are still felt generations later. The broken stones with their names and dates are scattered “helter-skelter” over the earth. No act of God created this landscape. A tsunami of human choices made the situation, and we don’t have to know the specific event to understand that it’s more than just stones in the poem that are broken. Families have been split, histories scattered. Effort has been made to wipe from memory the story of the lives on the stone fragments. Longing speaks from the scattered stones to the man in the poem whose heart sees in the stone fragments a story yearning to be told. How do we live after a tsunami, real or political, has destroyed our land, our people, our hearts? Is it possible to become whole again? Can we heal the past? The root of the word religion is to rebind. Religions across the world hold as their foundations an understanding that humans are fragmented beings. Even if we can’t or don’t say it directly in words, when we acknowledge our brokenness, when we search for and tenderly lift the fragments of our world with the intention to restore, as did the “sad, good man” in the poem in his act of cleansing the gravestone shards, we enter into a sacred, and one might even say, religious act. Through the man’s creative effort of documenting what once was once whole, he unifies again what had been broken for generations. Healing begins. Interestingly, Amichai at the poem’s end uses the word child’s play to describe the man’s act. Some, perhaps, would consider the man’s effort a ridiculous waste of energy and time. His is an intuitive act of heart, rather than of logic. Children are the natural advocates for the value of play, and putting together the puzzle of broken stones must in the end be play because it is play that renews, and remakes us. Re-creation is what the man’s perseverant play has accomplished. By the poem’s end, we realize we are witnessing a paradox, a world that is broken and whole at the same time, as a mosaic is both broken and whole. Does the man’s effort to restore the gravestones make a difference to those whose lives were blasted apart? If we understand our lives are connected into a webbed circle of being, as science leads us to understand, then what we do in one place and time affects the life of the whole. One act of kindness and healing changes the quality of all. The stone fragment the speaker in the poem saves is triangular, like the shape of the A in the word “Amen.” The poem relates a triad of actors, the destroyers who turned the gravestones to fragments, the man who “resurrects” the lives of the dead by reunifying the gravestones, and the preserver—the man who saves the stone with “Amen” written on it, putting to rest the prayer inside the stones’ longing: the story of the lives they stand for given back their substance. In the gravestones’ reconstructed puzzle and re-unified presence, the dead are re-given life. They are released—let go at last into a place of peace. A few months ago, I remember standing in a crowded New Delhi subway car at rush hour as the train door opened and passengers crammed and shoved their way through the door, hoping not to have to wait for the next car’s arrival. Pushed into the car’s back wall and pressed into a corner against the opposite wall, I watched as a woman hefted her large bag through the open door and pushed it across the floor between a profusion of bodies, then held on to the vertical steel bar in the middle of the floor, hoping to get her balance before the train took off. Behind her, though, passengers continued to shove themselves through the subway car’s open door—bodies piling into each other in a crush of sweating humanity. Hand still wrapped around her bag’s plastic rope handle, the woman attempted to stand. The bodies flooding through the doorway drove her toward the floor, however, catching her hand between the rope and the handrail. The woman cried out, straining to remove her strangled fingers from passengers’ weight pressing against her. She plead for people to stop. Deaf to her protests the deluge of bodies at the door, driven only by thought of getting on the train, continued to push forward. Stunned, I watched in silence, as the tsunami of bodies rammed through the door. I expected people to calm down, notice what they were doing, that the woman would be okay, but the situation continued. My husband, standing closer to the scene, pushed the men away from the woman, and joining her in protest, called out “Stop!” Finally, the subway doors closed, the flood resided, people found space to put their feet, and the woman could release her hand from the plastic rope handle’s stranglehold on her. She stood up. She was a short woman, I noticed, ruffled, but still in possession of herself. Why didn’t I act, I later wondered. What was it that made me simply stand there, saying nothing? As an outsider living in a foreign country, it’s not always clear when it’s okay to enter in to a scene, and when it’s not a good decision. Nevertheless, this woman was in need and yet I did nothing. Plenty enough times in my adult life I have felt powerless in situations, caught, and unable to discern the best course of action. These are fragmented parts of myself, and they don’t bring rest. If these moments were concrete objects, they could be dated and scattered about in the graveyard of past mistakes. What, though, if I took the journey of the man in Amichai’s poem? What if I bit by bit gathered the broken pieces, scrubbed them so I could name them clearly, and as if creating a work of art, gently set them together to let them tell their story and be released to a place of rest? Then, perhaps, I could live into a new story. The Japanese have a practice called wabi sabi—of filling cracked pottery pieces with gold. The cracks aren’t removed, but when the pot is repaired, it is even more beautiful than before. Brokenness creates space for acts of compassion and gentleness. This is how we make beauty from brokenness. Why do I continue living in India year after year? There are practical reasons, of course, but there are other reasons too. Just last week, for example, I saw a camel walking down the road amidst busy traffic. One doesn’t see that sight on the street every day! It’s not exactly common here either, but then again, it’s not something that could never happen. 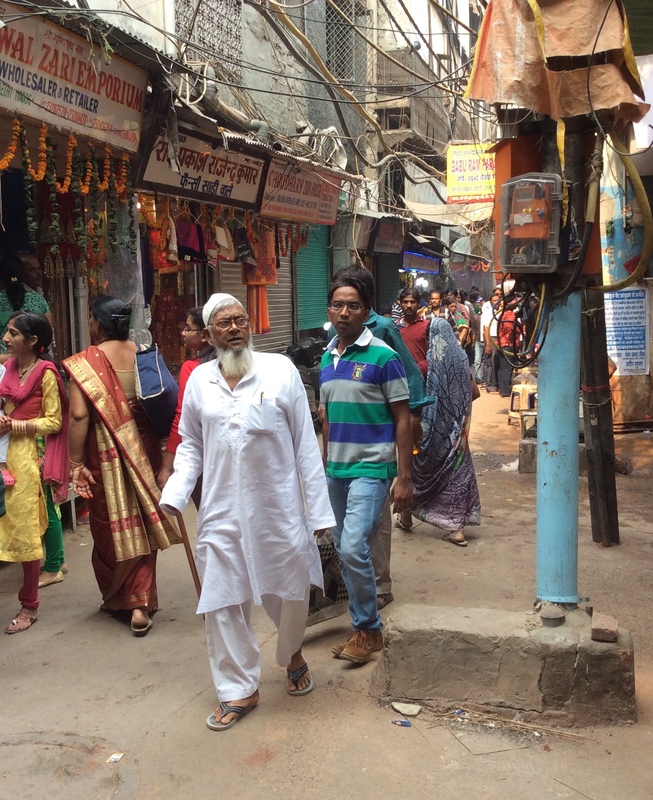 Though I’ve lived here for a number of years now, a recent trip to Old Delhi, like all trips to Old Delhi, opened my eyes once again to entirely other ways of being and living that remain a wonder even after seeing them many times. There is the wonder of wire, for example, and how the city caries on though wires are tied in Gorgonian knots most anywhere you choose to look up–yet it does, and that’s amazing. Monkeys climb around the neighborhood balconies, monkeys occasionally appear on the school roof, and climb along the wires, moving from building to building. People pull and push loads so large it seems it would be impossible for the driver to navigate. On the side of the street amidst busy traffic you might see someone getting his ear cleaned, a person taking a nap or quietly reading. Everywhere on the city streets people are engaged in activity–sweeping, selling, driving, sleeping, eating. A whole world that holds a thousand stories is laid before your eyes–narratives with intricacies and ways of being that remain a mystery to me, even though I view the story in process before my eyes. It’s true that India is full of many wonders but on the other hand, it’s also true that living in India with its enormous population, pollution and poverty constantly poses questions I don’t have answers for, this is one of the benefits of continuing to live here. It confronts me every day with challenges to the heart, mind and body. How do you negotiate daily through thick traffic? How do you breathe through months of smoke and pollution where the particulate matter in the air consistently ranges in the dangerous zone? How do you look at beggars on the street and who come to your door year after year and keep your heart open without looking away when there seems to be no end to their ongoing grief and pain? Even the dogs on the street carry in their bodies the imprint of loss and neglect. Look at their eyes and you can read their need. It is good to live with these questions, and to ponder them. They don’t go away, and won’t depart though I someday will. They make me ask questions about what is important in how I live, and what I’m doing with my life that matters–what are we doing together with the incredible gift of life on this earth. How are we using what we’ve been given for the good of all, including the earth itself? When we see need in those around us, and of the earth around us, we can see the parts of ourselves that are lost, alone, and broken, and feel compassion. We can become more aware of our own interdependence on others. None of us are truly self-sufficient. Henri Nouwen says, “We can trust that when we reach out with all our energy to the margins of our society we will discover that petty disagreements, fruitless debates, and paralysing rivalries will recede and gradually vanish.” Draw near, look the need in the eye. So often we don’t want to look at poverty in the eye. It’s too painful. We may not be able to fix the world with its pain and short comings. Still, we can reach out silently in our heart, with a “hello” of recognition. We can give a small offering of food. We can practice being present. The traditional story “Loosening the Stopper,” from the Hassidic Jews of Poland describes a man who had a lot of money and gave generously to the poor. One day, however, the man was in conversation with fellow businessmen when a beggar approached him asking for money. The man didn’t want to interrupt his conversation to get his purse, so simply gave the beggar the loose change he had. The beggar threw the coin at the wealthy man, hitting him in the face, declaring it was an insult since he could give so much more and why didn’t he? The wealthy man decided that from then on he was going to give only a half-penny to anyone. When two rabbis approach him later asking for a donation, they agree to be grateful for whatever was given them that day. The wealthy man gave his half penny, and the rabbis thanked the man for his generosity. Later, the wealthy man returned and gave them much more money, again returning to giving generously. The story concludes with one rabbi explaining to the other what it was that opened the wealthy man’s generosity. “It is also said that each step upward leads to another. Once we accepted his half-penny, we loosened the stopper on his generosity. Each gift he gave made the next one possible. Now, our willingness to receive has restored him to his goodness.” For those of us debating what to give, to whom and how, the wisdom in this story is to start somewhere. Give something. It is better to open up the stopper on your compassion than to go a lifetime holding back.